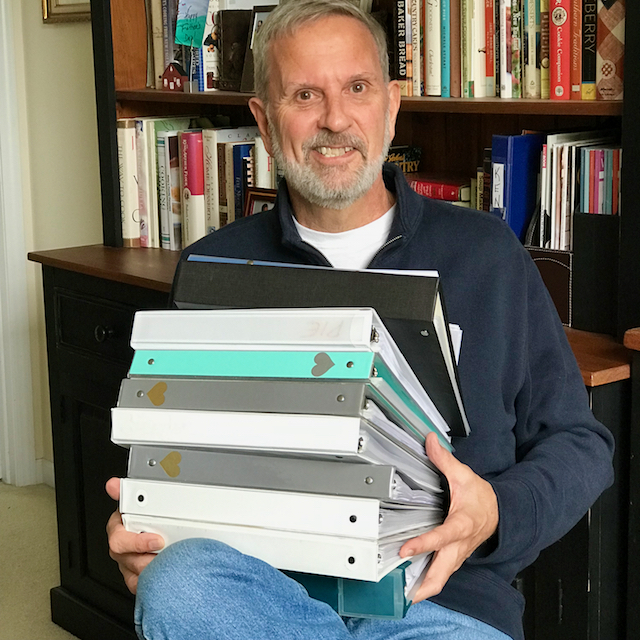 My latest book project took a giant leap forward this week when I sent the contents of the binders you see here off to my publisher for the first round of editing. Well, not the actual contents; I sent digital files, of course. Back when I started writing cookbooks in the late 80’s and early 90’s, writer and publisher would indeed volley reams of paper manuscript back and back and forth, the bulk growing progressively heavier with multi-colored sticky notes on each trip. You knew the manscript had come back when you heard the UPS truck pull up, followed by the sound of something like a meteor landing on your front porch. So that’s what the smile here is all about, equal parts satisfaction and relief. In case you missed the news in one of my earlier emails, the project in question is the renovation and marriage of my two books about sweet pies: Apple Pie and Pie, which I know many of you already own. This was no garden variety update, no mere fresh coat of paint. We’re talking a nearly 2-year process of reevaluating recipes, updating content, adding new material, fresh sidebars, and figuring out the best way to streamline the pie making process and make it less intimidating for home bakers – 180,942 words worth of that. The really fun part will come this summer when the recipes and some of the step-by-step material will be photographed. 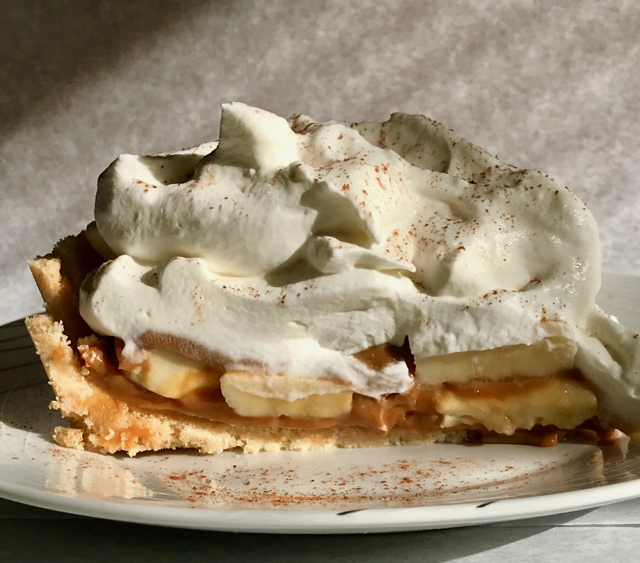 The book will be ready sometime next spring or summer, but until then I plan to tease you from time to time with some of the new content – this Banoffee Peanut Butter Pie, for starters. 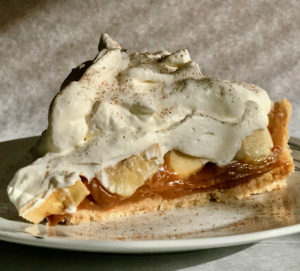 If you’ve never had banoffee pie (ba-NOFF-ee) it’s something like caramel banana cream pie, but easier since there’s no pastry cream to make. Credit for the original recipe goes to the owner of an English pub, the The Hungry Monk Restaurant in East Sussex. But what really makes this recipe stand out is the addition of the one ingredient that the filling has always longed for: peanut butter. 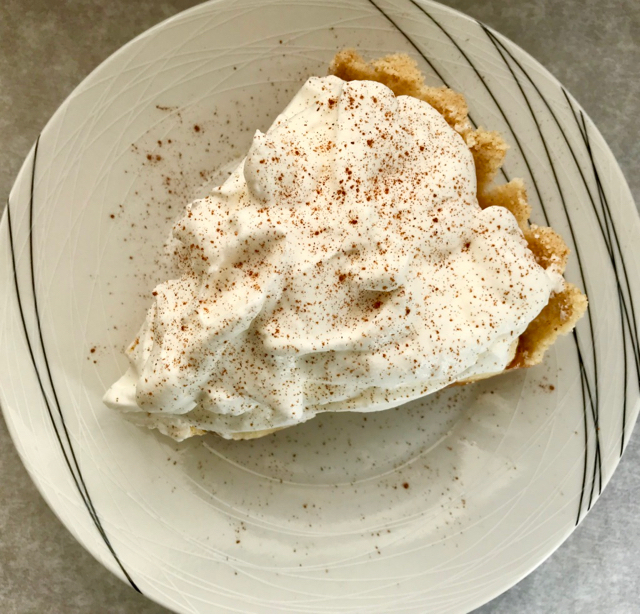 And while it’s true that I believe there’s almost nothing that can’t be improved by adding peanut butter, I think you’ll wholeheartedly accept my conclusion once you try this pie. I hope you enjoy it; I know you will. And I promise to keep you updated with news about the new book as things progress. Banoffee pie - layers of sliced banana and caramel or toffee in a crust - has become quite the thing in the last few years. Our version includes the usual suspects plus peanut butter, a match that was waiting to happen. I think you'll agree. As I say in the recipe, assemble this as close to serving time as possible because when you slice bananas too far ahead they can turn a little weepy. If you haven't already, prepare the Shortbread Cookie Crust (Notes) or the Peanut Graham Cracker Crust at the link provided. Set aside to cool. Put the dulce de leche and the peanut butter in a medium-size mixing bowl. Add about half of the water. Using a hand held electric mixer, beat the mixture on low speed until the water is incorporated, 30 to 60 seconds. Add the remaining water and continue to beat on medium-low speed just until the mixture is smooth and creamy. Assemble the pie, if possible, within an hour or two of serving it. Spread the dulce de leche mixture evenly over the bottom of the pie shell. Slice the bananas crosswise, then pile them over the dulce de leche filling. Don't worry if they're a bit random; the whipped cream is going to cover up the construction. Refrigerate. To make the whipped cream, chill a clean bowl and your electric mixer beaters in the fridge for about 10 minutes. Beat the cream until it holds soft peaks, then add the confectioners' sugar and vanilla. Continue to beat until the whipped cream is firm but not grainy. Refrigerate if not using immediately. Mound the whipped cream over the bananas. Refrigerate if you're not serving the pie right away. Right before serving, dust the top of the pie with cinnamon. To make Shortbread Cookie Crust, coarsely crumble shortbread cookies by hand - I use Keebler - measuring out 3 cups coarse crumbs. Transfer to a food processor and grind them into fine crumbs. Put the crumbs in a mixing bowl and add 3 tablespoons sugar and a scant 1/4 teaspoon salt. Mix by hand, then add 4 tablespoons melted unsalted butter. Mix well, then press the mixture into a 9- to 9 1/2-inch deep-dish pie pan. Refrigerate for 10 minutes. Preheat the oven to 350°F. Bake for 8 minutes on the middle rack. Cool before filling.